Hey kids! Today's polish is a brand new one in my stash, but I just couldn't wait to wear it! The Neverending Pile Challenge theme for today is blue (my other favorite color), and I had to try the bottle of Emily de Molly Turbulence that I just received in a polish swap! I actually included this polish in my first edition of Gimme That Polish back in February (and look at that amazing swatch--can you blame me?) and my swap buddy very wisely bought it for me. 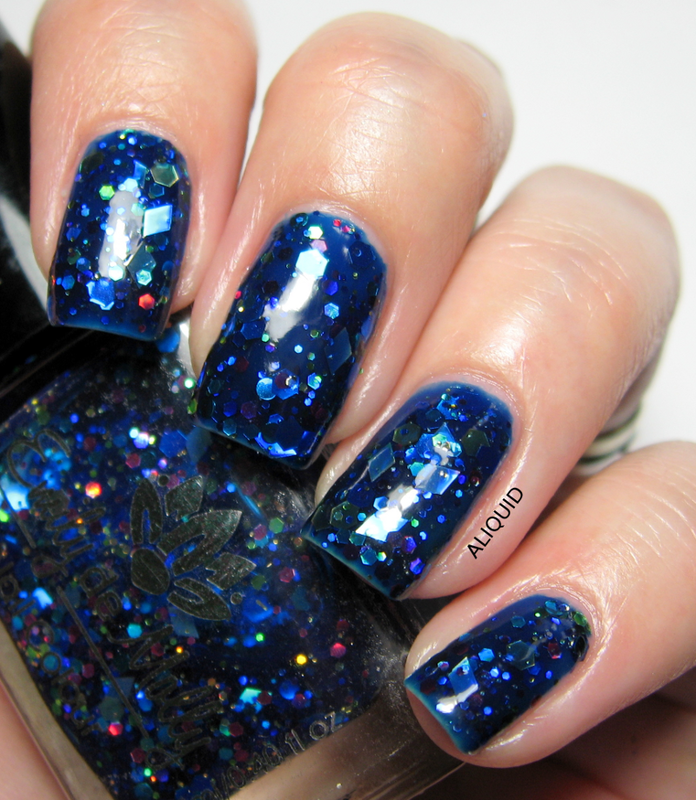 Turbulence is a deep blue jelly with loads of different glitters--diamonds, hexes and dots, blue, green, pink, and silver, lots of it holographic. Sadly I couldn't capture the true majesty of this polish with my crappy camera, so please go look at some better swatches as soon as you're done here! Emily de Molly Turbulence. Two coats with Out the Door topcoat. The formula was quite lovely--thick but not gummy, and I had no problem getting the largest glitters on my brush. I had to do some dabbing to get an even glitter distribution. I used one thinner coat with a thicker, glitter-packed coat on top. Please visit Emily de Molly's shop to buy Turbulence (they ship within Australia) or find their list of international stockists! Ugh, so pretty! I have been lemming this, and gave a bottle to my santee. That was so hard, let me tell you!! That is one pretty color! Its so packed with glitter in its jelly base.